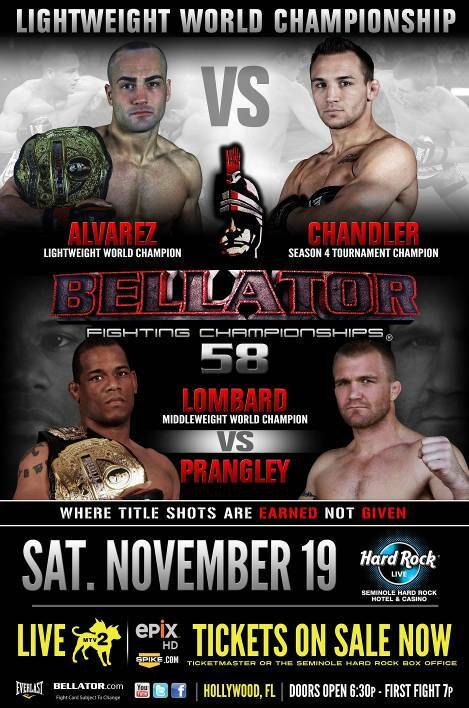 The Bellator Lightweight title will be on the line November 19th as Bellator Lightweight Champion Eddie Alvarez squares off against undefeated Michael Chandler from the Seminole Hard Rock Hotel & Casino at Bellator 58. Reigning Bellator Middleweight Champion Hector Lombard put his 24-fight unbeaten streak on the line against former UFC fighter Trevor Prangley in a non-title catchweight fight at 195 pounds. In the night’s main event, Alvarez brings a near perfect record into the fight. The Philadelphia native sports an incredible 22-2 professional record, with Bellator tournament wins over Greg Loughran, Eric Reynolds and Toby Imada during his Season 1 Lightweight Tournament Championship run. This won’t be Alvarez’s first title defense, as he successfully defended his title against current Featherweight Tournament finalist Pat Curran at Bellator 39. The two engaged in a five-round battle that eventually ended with Alvarez securing a unanimous decision victory. After a spectacular run through the Bellator Season 4 Lightweight Tournament that included victories over Polish prodigy Marcin Held, submission specialist Lloyd Woodard and explosive Brazilian Patricky Pitbull, the undefeated Chandler is ready for the challenge Alvarez will bring. While the heavy-handed Hector Lombard watches the Season 5 Middleweight Tournament with a close eye, his focus will shift to former UFC veteran Trevor Prangley, as the Cuban-born middleweight champion will battle near his Florida residence in a non-title affair. For the second week in a row, Bellator will host a women’s feature fight as long time Bellator veteran and fan favorite Jessica “Jag” Aguilar will battle Lisa Ward, who will be looking to move to 2-0 against Aguilar with a victory at Bellator 58. The night will also host the return of a few fan favorites as Top 10 ranked featherweight Marlon Sandro is back with Bellator after a Summer Series Featherweight Tournament Finals appearance. The impressive Brazilian takes on submission ace Rafael “The Law’ Dias in a 145-pound feature fight.